The bathroom is your relaxing oasis  a place where you can shut out the busyness of the day with a warm bath or steam shower. For an active home and the demanding life, your bathroom should be more than just another "utility room," it should be a retreat. Just take a look at the facts  the average person visits the bathroom approximately 2,500 times per year  this room gets a lot of traffic, but is often neglected for proper attention. But, a growing trend has emerged, and we think you should join! Bathrooms are getting bigger and better, now  and there is now an influx of more homeowners seeking to remodel and redesign their bathroom. Bathrooms have become a central remodeling project for homeowners to tackle. Many are tearing down walls and creating an open design, adding space, function, and luxury. In many cases, radiant heat is a main part of the bath remodel. In fact, 70 percent of our own customers who purchase radiant floor heating purpose it for a bathroom floor. Why Install Radiant Heat in the Bathroom ? - Ban Cold Floors ! The alarm clock goes off, early on a chilly morning. Don't let your feet touch a shockingly cold tile floor. Wake up refreshed, and ease comfortably into your day with radiant floor heating that evenly heats tile and stone floors, making them a treat to step onto after a refreshing shower or bath. As a primary heat source, it promotes healthy living, emitting rays that are gently and safely absorbed in your home; like the sun's rays are absorbed to heat the earth. And, because radiant heat is absorbed into the muscle tissue, it will improve joint and muscle flexibility and reduce swelling - promoting proper body circulation. From floor heating to radiant panels and towel warmers, our products are not only efficient, but they are easy to install. With custom installation SmartPlans, to easy to install innovative products, right down to our trusted 24/7 installation and technical support, we are here to support you every step of the way. Whether you are a professional in the field or a "do-it-yourselfer," we are confident when we say that your installation will be a breeze! Radiant floor heating is an "easy sell" in a down market. One in every five people or 20% of potential home buyers say that floor heating is a desired luxury when searching for and buying a new home. Comfort and efficiency are the two main reasons why potential homebuyers and homeowners alike, love radiant floor heating. Investing in eco-friendly improvements in your home reduces emissions and saves you money  from tax breaks to lower energy bills. Many homeowners receive 80% payback from their initial investment in a bathroom once they sell their homes, according to Betty Crane in her article. - Saves YOU Money ! Our radiant heat products are energy efficient, saving you money over time. Adding and installing electric radiant heat will actually lower your heating bill. Our TempZone electric floor heating systems offer optimal energy efficiency; converting 100% of the energy into heat rather than wasted consumption. With radiant heating, every degree you lower your thermostat, you can save 5% off your heating bill, saving you up to 25-30% annually. 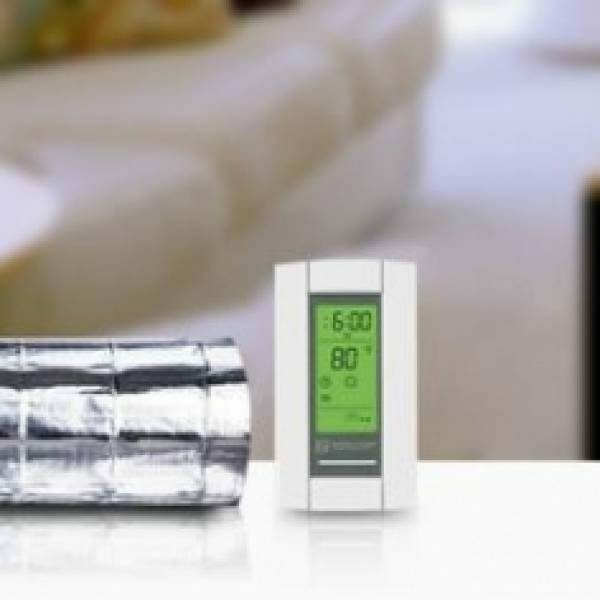 With a programmable thermostat, like our SmartStat thermostat, paired with electric floor heating, you can program the heat up around your morning and bedtime routine, effectively lower your energy bill, costing only $0.16 per day to run in a large master bathroom. Add extra warmth and comfort to carpet, laminate and floating wood flooring with a WarmlyYours Environ Easy Mats floor warming system. Environ Easy Mats is a wafer thin non-adhesive mat that installs directly in between the pad and carpet or floating wood flooring to heat the floor and provide even, room-filling warmth. At 12 watts per sq. ft., Environ Easy Mat systems allow for gradual warming of delicate carpet any floating wood floor coverings and are energy efficient. Watts: 12 watts per sq ft.